Traveling by air can often lead to mishaps. 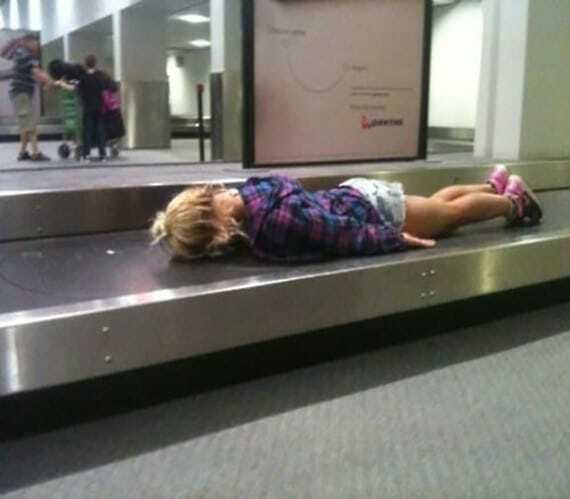 Here are some of the most hilarious airport moments that happened to be captured on film. It’s common knowledge that international travel often leads to less than ideal sleeping conditions. You’re either forced to cram yourself into a small seat, attempting to catch a few winks, or your left to try and doze between flights. This woman got creative, fitting her small frame through the armrests that had been deliberately placed to prevent her from sleeping. Air passengers arrive for their flights armed with all sorts of tools to try and maximize comfort while their spending half a day or more in the air. 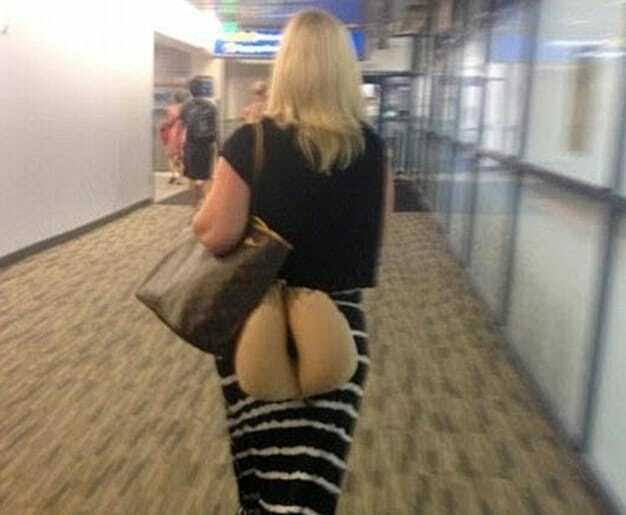 This woman brought along a travel pillow, as many do, however, it seems that it never occurred to her that placement is everything with a tan colored pillow. Rather than appearing ready for comfort, many unsuspecting passengers kept mistaking her pillow for a bared bottom as they passed her in the terminal. If you see someone at the airport walking around wearing shades, there’s a pretty good chance that this person might be a celebrity. In fact, we’d say that 64% of the time, this is true (don’t ask us where we got that percentage from). At any rate, this photo only backs up our claim, as this is none other than Victoria’s Secret legend Candice Swanepoel. It’s unclear whether she’s touching down or taking off from her beloved South Africa. Whatever she’s doing, she looks good while doing it. It’s no secret that kids are growing up later these days. While the baby boomer generation were often already married home owners by their late 20’s, these days young adults are far less likely to move out and start a family of their own at the same age. 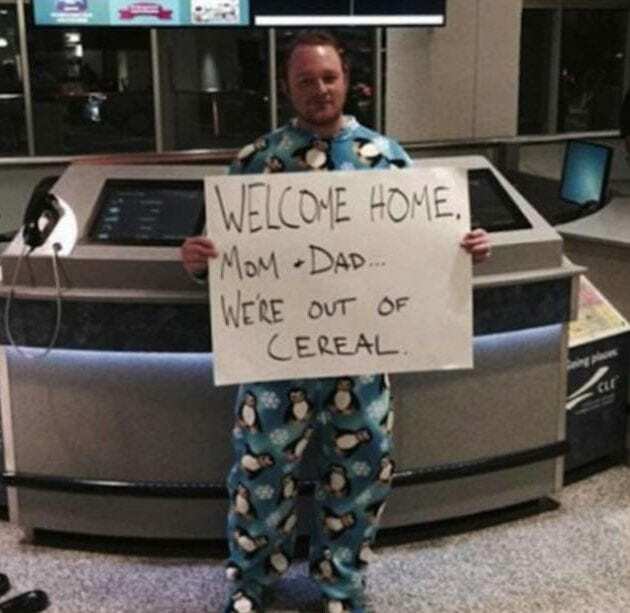 This millennial decided to prank his parents by showing up at the airport in his footie pajamas, informing them that he ran out of cereal while they were away. We hope his parents were in on the joke. Another day, another beautiful face passing through the airport. Even the likes of Evelyn Sharma needs to proceed with us mere mortals from time to time. The German-born model has even broken into Bollywood, starring in movies such as From Sydney With Love. Her latest movie Saaho, is scheduled to come out later this year. With that said, there is a good chance that this was the movie that Sharma was on her way to filming in this very photo! These four super fans had the brilliant idea to dress up in a group costume in anticipation of their friend’s return to Denver just in time for the release of the latest Star Wars movie. 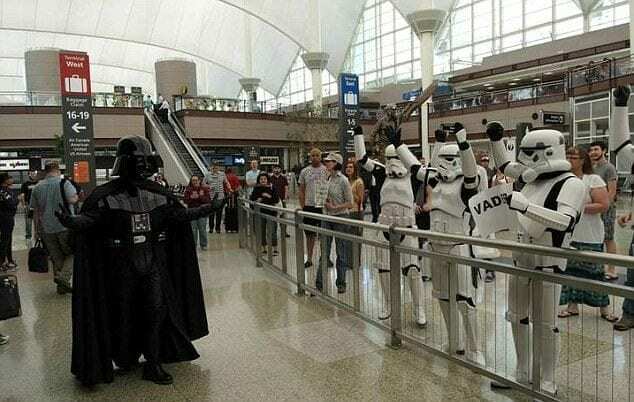 The group fully committed to the joke, even writing “Vader” on the sign they held up for him, while Vader himself made a grand entrance into the arrivals to the tune of the “Imperial March”. Onlookers were delighted by the hilarious display. She might be approaching 40, but Minka Kelly doesn’t look a day over 23! With stunning longevity, the Friday Night Lights star seems to blow everyone away whenever she walks through an airport. It’s unclear where she was going based on this photo alone. However, we’d hazard a guess that she was on her way to the set of the new TV show Titans, which is based on the DC comic of the same name. She plays the character Dove, naturally. Airport mishaps come in various shapes and sizes. Sometimes they get your meal wrong, sometimes your flight is delayed, and sometimes they lose your luggage before an important business trip. This man was so pissed about his lost luggage on his return flight that he chose to turn up in only his undies, just to show the unsuspecting airport staff the consequences of their negligence. Others may have thought it was a joke, but this guy was serious business. You might be thinking to yourself, “that’s not Sophie Turner. Sophie Turner is a young British actress who stars in Game Of Thrones!” However, it turns out that there is actually another Sophie Turner – a model from Down Under known as the Saucy Aussie! Of course, if Turner wants to get anywhere in the world, she needs to book a flight through Qantas and endure a long-haul flight. Sometimes it will be five hours long and other times, it’ll be 20! The nonchalant Italian attitude regarding living life and having fun has carried over even to airport security. One scrupulous passenger glanced behind him only to notice something bizarre on this employee’s computer screen. 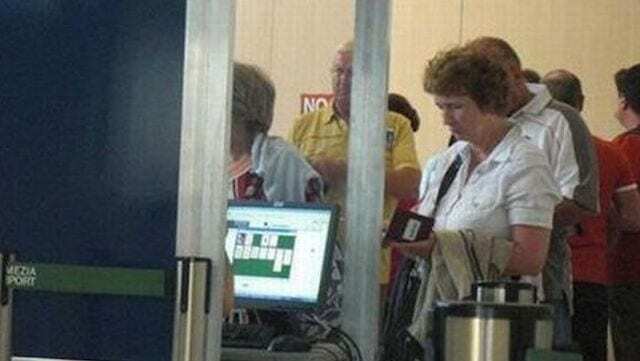 No, they weren’t vigilantly checking luggage, or visa validation, they were passing the time playing solitaire. Then again, who wouldn’t get bored checking passport after passport. At a certain point, even the most exotic passports lose their novelty. So play on! We all deserve to have some fun at work. 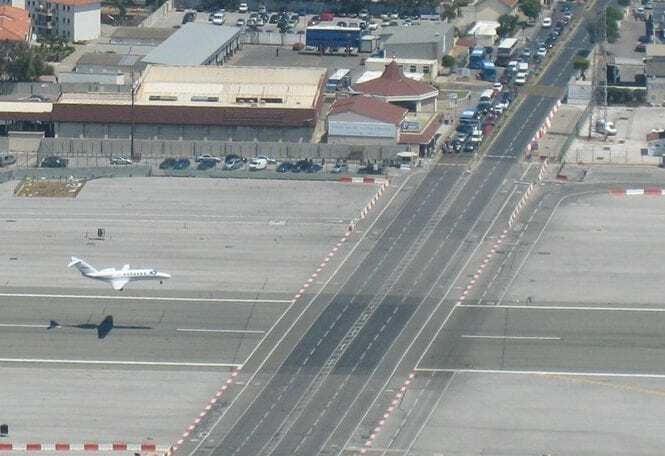 Regional airports, tucked into the midst of a small island are often short on space, so this one city decided to compromise, intersecting its runway with a main thoroughfare, without realizing of course that landing planes can be a hazard to everyday drivers. Unfortunately, they don’t have the resources to reroute either the avenue or the runway, so they’ve been making out like a drawbridge or train crossing, constantly forcing drivers to halt for indeterminate amounts of time whenever a plane is landing. New mothers know how hard it can be to juggle life with a baby. This mother needed a safe place to put her little one down where he couldn’t crawl away while removing her shoes for a security check. The baby at least looks happily occupied, giving mom the moment she needed to breathe and take care of business. 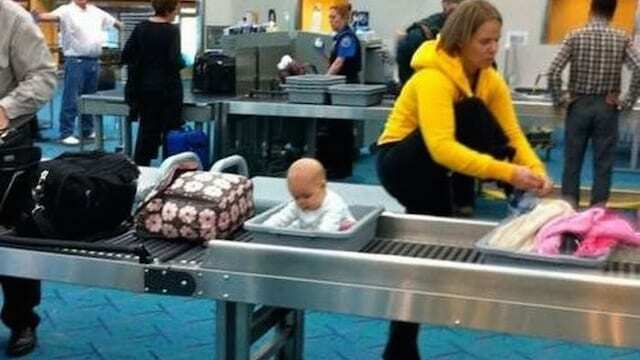 Hopefully, the baby doesn’t resent her later when he finds out she dumped him in a security-check bin at such a formative age. When the realization that you want to spend your life with someone hits you, sometimes it doesn’t matter if the scenario is highly romantic or not. It just matters that you let your partner know just how important they are to you. So when this guy went to the airport to meet his longterm girlfriend, he just couldn’t hold himself back anymore. 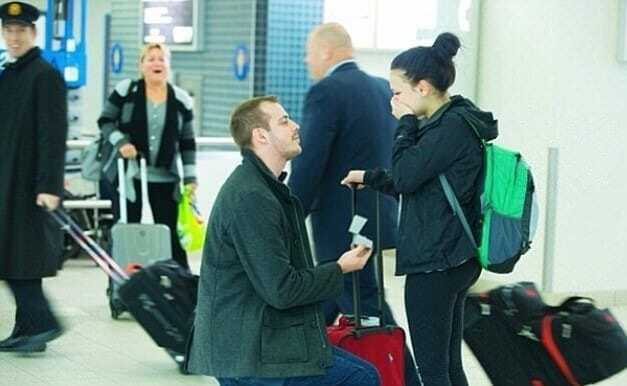 He had missed her so much while she was away, he got down on his knee right in the terminal. The lengths passengers go in order to ensure their personal comfort in flight is usually standard. We can’t really blame this guy for wanting to use his noise cancelling headphones, plus a neck pillow and eye mask, as all can help contribute to a more pleasant flight experience, especially when you’re intent on sleeping throughout the flight. 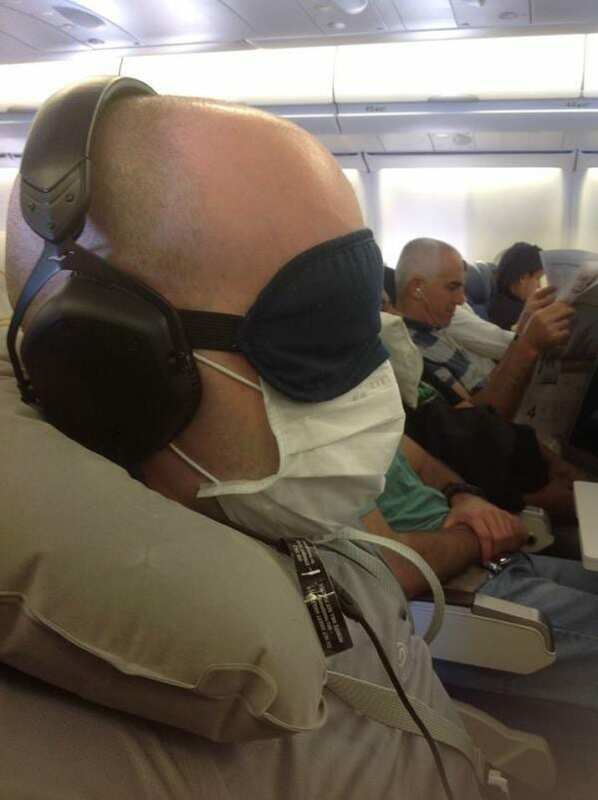 What makes this guy stand out is his insistence on using a respiratory mask in order to keep the airplane cooties away. Kids often take inspiration from their surroundings, attempting to copy what they see on TV and in movies. This little girl really wanted to greet her grandparents at the airport like she always saw others do, and she needed to complete the look with a sign of her own. 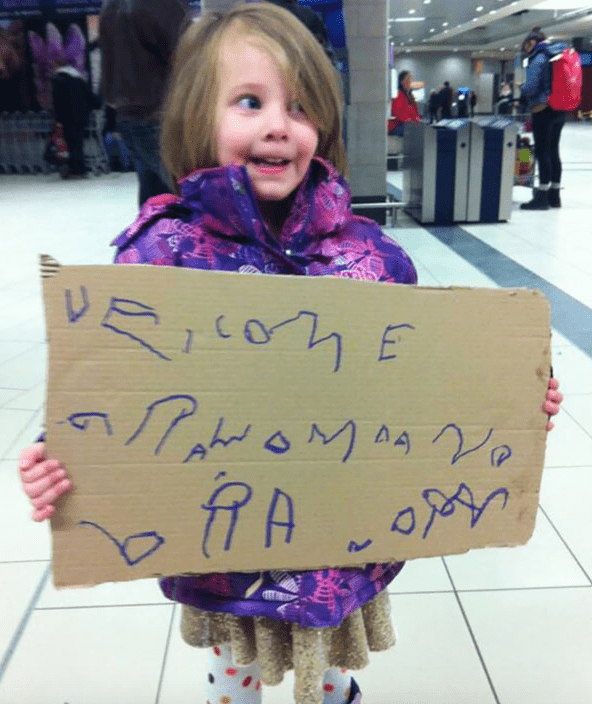 Though she hasn’t quite mastered the art of letters yet, this youngster’s sign was touching just the same. Give her another year, and “grandma” and “grandpa” will almost certainly be legible. Maho Beach in the Dutch controlled portion of St. Martin is notable for very different reasons than most Caribbean beaches. Though there may be prettier or more comfortable places to sunbathe, its proximity to the airport makes for some impressive photo opportunities. 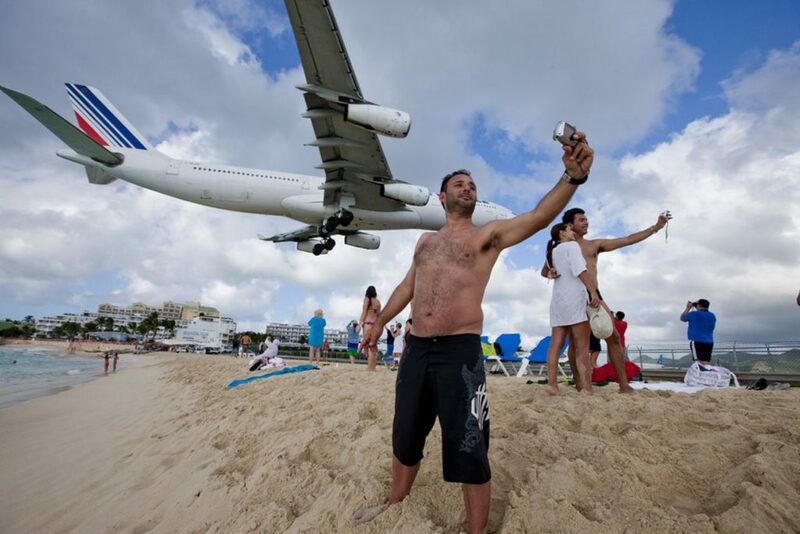 Travelers often go there with the sole purpose of taking a plane selfie as the aircraft descends behind them in full view of the camera. We hope this beach also has a jet blast warning sign posted though. These Friends Recreated A Couple's Engagement Photos And It Is So Much Better Than The Original! Most Powerful Photos Ever Taken That Truly Reflects The Human Experience.